Matt Strauss is the steward of one of the nation’s largest pay-TV distributors of video and entertainment services. Under his leadership, he became one of the pioneers of video-on-demand (VOD) development within Comcast, including the Xfinity X1 Entertainment Operating System, which is a cloud-based set top. Xfinity on Demand now has one of the largest programming catalogs in the world, and drives more that 3 billion views per year. Strauss graduated from New York University, and cut his teeth on VOD with Rainbow Media. He also worked on the network side, holding several management positions with Disney/ABC-TV, including Strategic Planning. He joined Comcast in 2004 as a Senior VP in New Media, and has evolved that discipline throughout his career at the company. He has been honored with recognition in the industry, including the “Mark Award” through the Cable & Telecommunications Association for Marketing. Who better then to talk about the current state of television? Matt Strauss sat down with HollywoodChicago.com to discuss those issues, plus his background in the business of the medium. The interview is split between a transcript and an audio podcast. HollywoodChicago.com: What has been most revolutionary about Comcast and X1 in the last five years, and how do you see that innovation evolving television consumption? 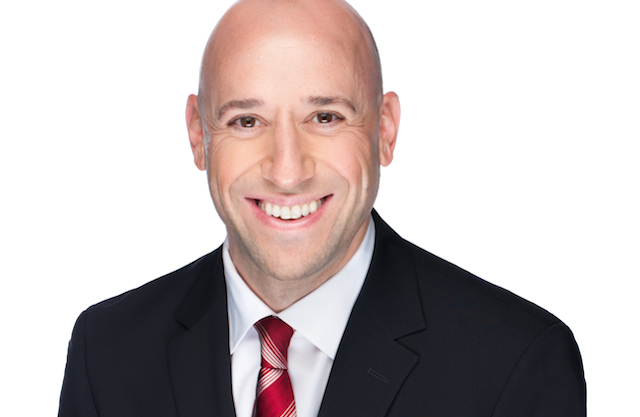 Matt Strauss: I’ll start by stepping back… live ratings for TV are continuing to decline, that’s not a surprise. But what is not always talked about is when we look at total video consumption, we see it growing. It’s not that people are watching less TV, they are actually watching more. They are doing on a time-shift basis on their terms, and their devices, and actually they’re watching smarter. With that trend you have more high quality TV that is available, more than anytime in the history of the medium. There is original programming on places were it never was before, online and on basic cable channels. You take that and marry it with the technological advancements, and our vision has always been at Comcast to give customers the ability to watch what they want when they want it. That’s almost come to be expected… I have four kids and they don’t know what live TV is, they are the beneficiaries of the current technology. When they want to watch ‘Spongebob Squarepants,’ they watch it. HollywoodChicago.com: What other circumstances have you observed from the watch-when-I-want-to-watch era? Strauss: In many ways, it has created an instant gratification entertainment culture, and our company is at the tip of that particular spear. We launched video-on-demand 15 years, and if you go back to that era Netflix was still delivering DVDs, Hulu and YouTube didn’t exist, and we were streaming the on-demand content to cable boxes. I remember early on, no matter what we offered in VOD, people would watch it, because there wasn’t that much. But they would order it because they could pick it, and we knew that this was lightning in a bottle. There was no turning back. In many ways, the cloud-based X1 technology is the realization of this vision, to give our customers unfettered access. We do in a year about four billion hours of on-demand content, which averages out to about 25 hours per customer per month. So you can see what’s happening – there is so much great programming options that it’s impossible for the average human to know when it’s on live TV. Before it had to go onto a DVR, but now we have the TOP 100 rated shows pre-loaded and available. HollywoodChicago.com: How has that changed viewing habits? Strauss: On-demand has become a sampling tool, it’s where customers go to both find a show and catch up with it. As the technology grows, we give a lot of thought on how to present the content, how do we provide recommendations, and how do we curate it to be personalized. That’s how we developed the voice option, to cut through all the choices. In that case, you don’t have to know anything except what you want to watch. If you say ‘Star Wars,’ you get the choices of that series. All the capabilities we’re been building upon are finally coming to life in this X1 technology. And it’s resonating with our customers. HollywoodChicago.com: You mentioned the lowering ratings for live TV. How has measurement changed, especially for establishing advertising rates? Does Comcast work with Nielsen, for example, in providing data for them? Strauss: Obviously, the Nielsen data is still the major currency as to how advertising is bought and sold today. We realized early on that our platform needed to support Nielsen measurement. It respects the codes that Nielsen has established, and everything on demand and through DVR system gets measured by Nielsen. Not only is X1 measured, but we can break it out separately to compare it to the rest of the viewing habits in the country. We recognize, whether you like it or not, that advertising is still a critical piece of the overall ecosystem. We felt like we had to support the measurement, and support all the measurement systems. We’ve also established in our system, much like an internet website, a way to swap out ads for a more targeted audience. If we do this ‘new advertising’ right, it adds up to more content for our audience. The better monetizing options there are for programmers, leads to more potential for creating new programming, and that expands what we can offer. Right now, our on-demand options are so great, that if we were a television network we’d be the top rated network on television. HollywoodChicago.com: How is that a game changer? Strauss: Well, I can’t make a bad show good, [laughs] but what I can do is drive audience, and when we promote a show or event, we can measure how X1 affects it separately, which in turn supports the TV and advertising ecosystem. It’s good for customer selection, it’s obviously good for programmers, and it makes X1 a differentiator for us competitively. I believe the experience of X1 is best in class, and we’re proud of it. In the audio portion of the interview, Matt Strauss talks about the history of the “New Media,” why he takes issue with the term “cable provider” and what still makes his family gather around the television. For more information about Xfinity by Comcast, click here.